BOULDER, Colorado, August 28, 2012 (ENS) – Arctic sea ice cover has melted to its lowest extent in the 33-year satellite record, breaking the previous record low observed in 2007. With two to three weeks left in the melt season, scientists expect the ice cover to shrink even more. 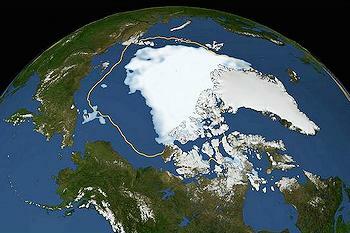 On August 26, Arctic sea ice extent fell to 1.58 million square miles as measured by the special sensor microwave/imager on the U.S. Defense Meteorological Satellite Program spacecraft and analyzed by scientists with the National Aeronautic and Space Administration, NASA, and the National Snow and Ice Data Center, NSIDC, in Boulder, Colorado. This was 27,000 square miles less than the previous low of 1.61 million square miles recorded on September 18, 2007. Arctic sea ice follows an annual cycle of melting through the warm summer months and refreezing in the winter. While Arctic sea ice extent varies from year to year because of changeable weather conditions, ice extent has shown an overall decline over the past 33 years. Scientists consider the decline in summer Arctic sea ice over the last decade a strong signal of long-term climate warming. “The previous record, set in 2007, occurred because of near perfect summer weather for melting ice. Apart from one big storm in early August, weather patterns this year were unremarkable,” said NSIDC Director Mark Serreze. “The ice is so thin and weak now, it doesn’t matter how the winds blow,” said Serreze. NSIDC is part of the Cooperative Institute for Research in Environmental Sciences at the University of Colorado, Boulder. The sea ice cap naturally grows during the cold Arctic winters and shrinks when temperatures climb in the spring and summer. But over the last three decades, satellites have observed a 13 percent decline per decade in the minimum summertime extent of the sea ice. The thickness of the sea ice cover also continues to decline. The new record was reached before the end of the melt season in the Arctic, which usually takes place in mid- to late-September. Scientists expect to see an even larger loss of sea ice in the coming weeks. NSIDC scientists will release a full analysis of the melt season in early October, once monthly data are available for September.